Added by Indo American News on July 25, 2013. Pinnis are a uniquely traditional Punjabi sweet dish that are sometimes mistakenly called laddus by non-Punjabis. The main difference is that laddus are usually made of fried dough and are then formed into balls, whereas pinnis are made with flour (or crushed moong dal) that is browned in a kadai or wok. There are other differences too: pinnis are not drenched in syrup and most also contain mewa (dry fruits), ajwain or a bitter til which a uniquely Punjabi taste. And their taste is completely different from the traditional laddus. Pinnis are usually made and served in the cold winter months in the Punjab as they give lots of warmth and energy. Because of the way they are prepared, they can be kept in a tightly closed container for weeks and even months and not go bad. There many styles of pinnis, and the ones of Amritsar are considered exceptional, in fact many people ask visiting relatives to pick up cases of pinnis from the city. Do not use chasani (sugar syrup) because the granulated sugar you get here is very fine. If you make pinnis with sugar syrup, they do not keep for very long. Pinnis made with dry sugar do not go bad for a very long time and do not need to be refrigerated. In the old days, before refrigerators, we used to keep the pinnis in pipas (tall tin cans) without any problems. Pinnis aren’t hard to make, and the preparations leading upto making the round balls are not time consuming as many ingredients are available in most Indian households. Our family used to make them at home for our large extended family when we had our ancestral lands and home in Lyallpur (which became part of Pakistan after the Partition). My grandmothers and mother brought the recipes with them and would make pinnis every winter in Delhi. 1. Heat the ghee or olive oil in a kadai or wok over low heat. 2. Throw in the flour and brown it, stirring often as you don’t want to have the flour get too brown as it may give a burnt smell. 3. After the flour is slightly brown, thrown in whatever dry fruit you desire and mix well. 4. For added flavor, use khoya in the pinnis. If you like, throw in the khoya, but first brown it over low heat too. 5. Turn off the heat and throw in the sugar and mix well. 6. 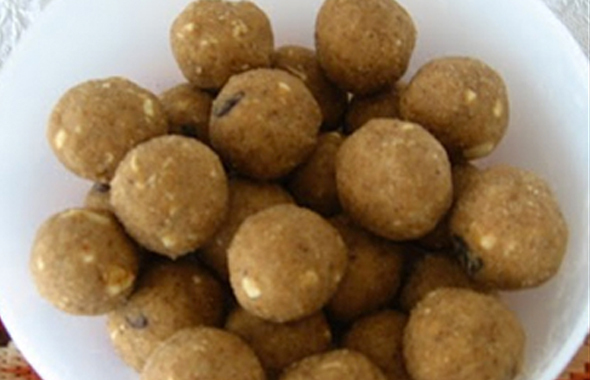 After the mixture has cooled down and can be touched, take a small amount of the mixture and form into a 1.5 inch ball in the cup of your hand. 7. Place the balls on a tray or plate to cool down and congeal further. Eat when the balls are cool. Some people actually like to eat these warm as they say the pinnis taste better. Shakuntla Malhotra is a skilled cook of Punjabi dishes made in the old-fashioned style that she learnt as a young woman in her ancestral home in Lyallpur, India before it became part of Pakistan after the Partition in 1947. People have often admired her cooking for its simplicity and taste that comes with each mouthful. 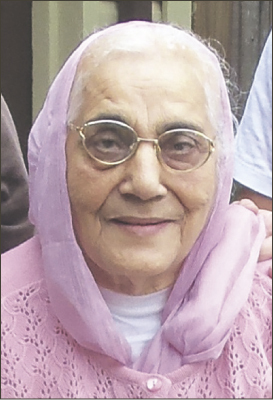 Even in her mid-eighties, she continues to cook daily and agreed to share some of her delectable Punjabi recipes.